We have moved on to our next project in our steps to beautify our home. We have purchased siding and now we are waiting for it to come in and be delivered. In the mean time, Steve decided to update our front porch railings. Our front porch and back decks are a real sore spot with me. In fact they are a sore spot with Steve as well. When we had our mobile home moved onto our land, it just so happened that our insurance company decided to make a surprise inspection. When they saw that we had no porches or decks in front of the doors...well you can imagine. We were given one month to rectify the situation. This seems like a long time, but when we both have full time jobs, and two small children to take care of, it's not as easy as you think. We decided to go the easy route and buy deck kits for all three entrances. Before that decision was made and before the insurance gave us an ultimatum, we had actually been drawing up plans, and dreaming of the deck that we wanted to build, but at this time we knew we had to put our dream deck on hold. We had to build our decks during some of the hottest days of July. I'll never forget trying to dig for footings for the deck. There actually was no digging. We kept hitting rock. It was almost impossible, it was extremely hot, and the deck kit ended up being a lot uglier than I thought it would. We did our best and we got three decks built in just a little under 4 weeks. The porch railing before. Steve started dismantling it before taking a picture. The biggest issue with me and those decks are the railings. You can see in the picture above, just how ugly the railings are. In preparation for our new siding, the railings on the front porch had to be removed. I have asked Steve for a couple of years to change out the railings in front. There was another issue with those railings that I hated besides the way they looked. If we ever sat on our front porch, those railings were right at my eye level! I couldn't see anything except ugly railing! So they had to go, and while Steve was more than happy to do that, something had always come up that was more important. 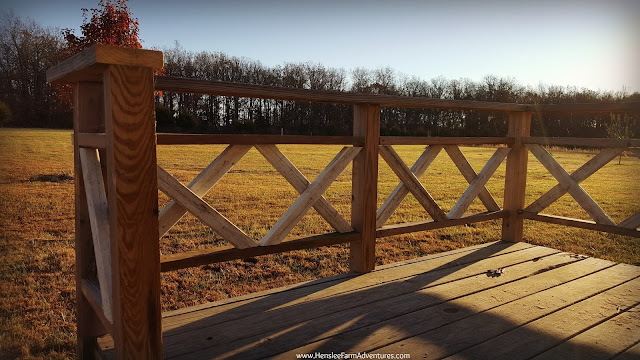 Now that the railings are removed, Steve decided to take the time to build new ones. 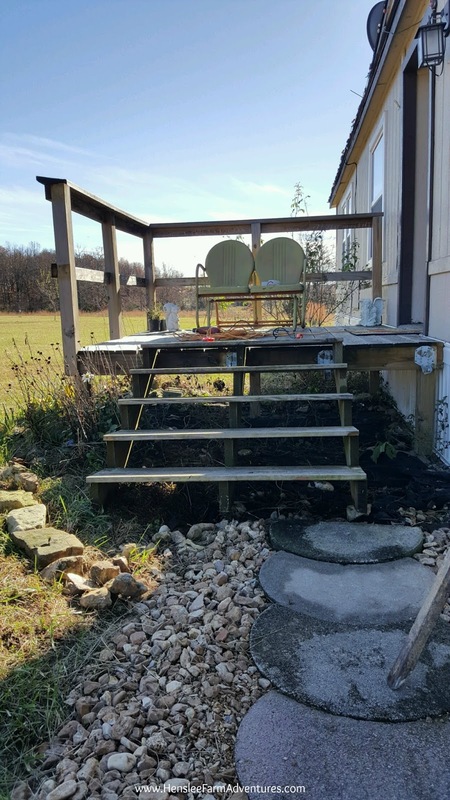 In this process we also decided to move the stairs to the middle of the porch rather than against the house. Weeds would grow between the house and the stairs and it was almost impossible to keep them cleared out! The picture above shows the new placement of the stairs. Determining railing height so I could actually see over them! 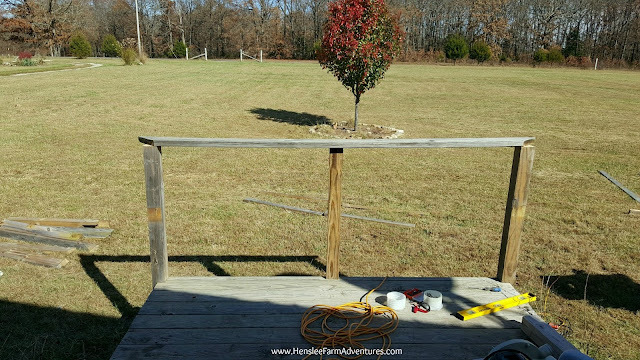 Since we are planning on painting the deck and railings white, we was able to use scrap lumber that he already had. He knew (and got my okay) that he wanted to make X's along the front, but he wasn't sure how he was going to do it. Close up of the X's we both liked! He said that he tried laying the boards different ways in order to make one big X in each of the sections, but when it didn't look good, he decided to make a couple of X's in each section. If you look closely below, you can see that he actually made two V's. An upward V on the frontside of the railing and a downward V on the backside of the railing. Close up of inside of railing and you can see how he constructed it. When I saw the picture, I fell in love. It looked so good and I am so happy with it. 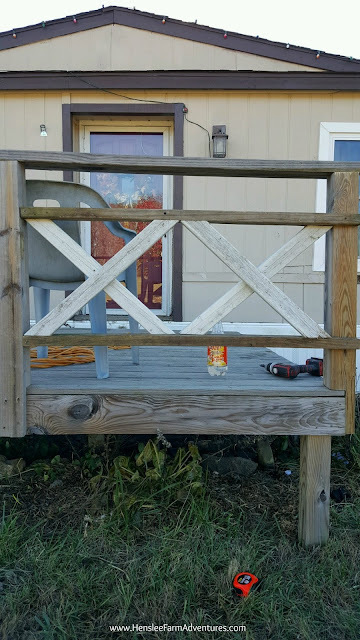 It is not completely put together, as you can see above, he will wait until the siding is up and then put the porch back together and secure all the X's back in, plus he wanted to make sure I was 100% happy with it before making it permanent. Smart man! 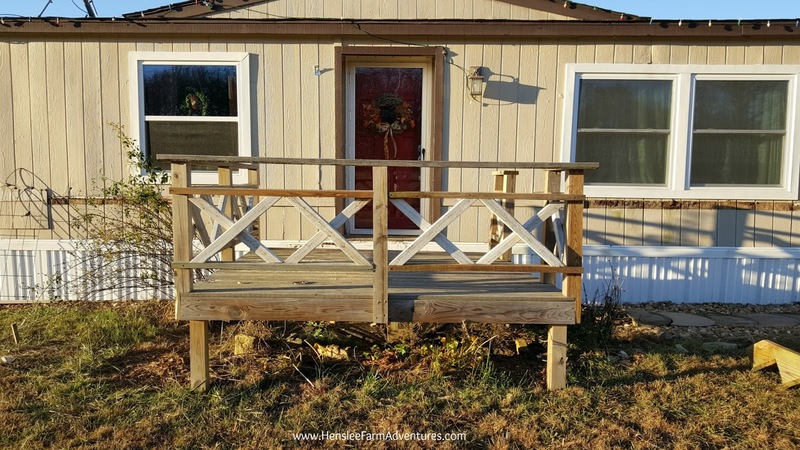 Front view of porch railing, and view of how desperately we need siding! I can hardly wait for the siding to go up and to share that with you, but also for the new porch railing as well. I love that this project cost us ZERO DOLLARS because we were able to use lumber from an old deck that we dismantled. It is great that we can use what we already have on hand to help make our place more beautiful. 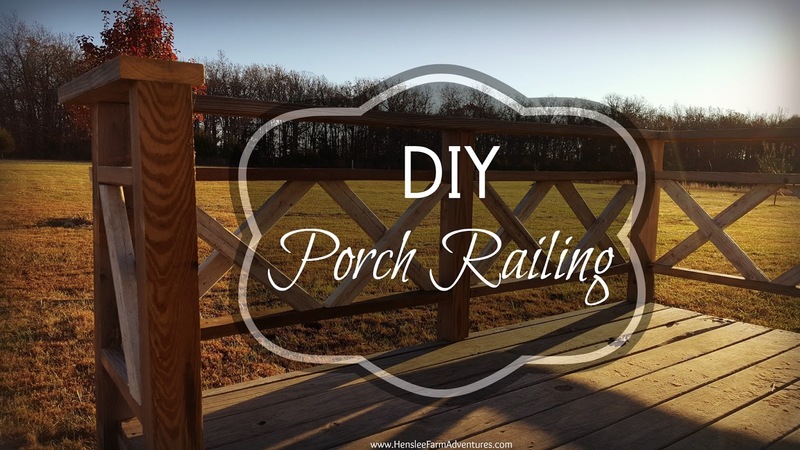 Let me know below what you think of the porch railings!